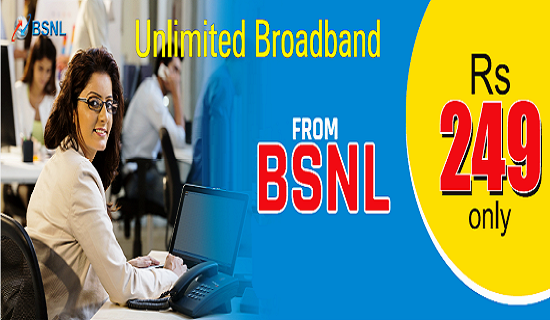 BSNL has announced the revision of condition of plan migration period limit under existing entry level unlimited Broadband plan 'Experience Unlimited BB 249' from six months to One Year. At present, all new broadband customers in Rs. 249/- plan will be converted to 'BBG Combo ULD 499' plan after completing 6 billing cycles. As per the latest information, migration to 'BBG Combo ULD 499' plan will be done only after one year. It means, customers may enjoy unlimited broadband @ just Rs 249/month for first One Year. After one year, plan 'Experience Unlimited BB 249' shall be converted to 'BBG Combo ULD 499' plan. This latest revision will be available for all the new Broadband customers and for those existing customers under 'Experience Unlimited BB 249' plan, who have not been migrated to 'BBG Combo ULD 499' plan yet. Customer’s consent in this regard shall be taken at the time of CAF filling. All other terms & conditions for availing Broadband plan ‘Experience Unlimited BB 249’ shall remain same. These instructions shall be effective with effect from 08-05-2017 in all the Circles (except J&K and A&N Circles). As reported earlier, BSNL extended this promotional Unlimited Broadband plan till 30th June 2017. Customers may also avail free installation charges for both landline & broadband services in 'Experience Unlimited BB 249' plan. BSNL received overwhelming response for this wireline broadband plan and observed that customers are able to download and upload heavy data up to even 390 GB in a month under this plan. Hence per GB data cost comes out to be even less than Rs 1/- per GB.